Preheat oven to 325 degrees. Spray a 2 8 inch round pans with non-stick cooking spray. Dust the pans with 2 T. all-purpose flour. Tap out any excess flour. This will help keep the cake from sticking. Set aside. Peel, core, and dice 2 large pears. Set aside while making cake batter. In a large mixing bowl, add in the butter and sugar. Mix until light and fluffy, about 3 minutes. Add in the vanilla extract and each egg one at a time until incorporated. Scrape down the sides after each egg. In a separate bowl, add in the flour, baking powder, baking soda and salt. Stir to combine. Measure out buttermilk and pear juice. Alternately add the flour and buttermilk/pear juice always starting and ending with the flour. I did 3 parts flour and 2 parts buttermilk. Scrape down the sides and mix to combine. Stir the diced pears into the batter until they're incorporated. Pour the batter into the prepared round pans. Spread evenly out. I used bake-even strips to try to keep the cakes level as they baked. Place into the preheated oven and let bake for 55 minutes or until a toothpick comes out clean or with moist crumbs. Let the cakes cool for about 20 minutes. Turn the cakes out onto a wire rack and cool completely. In a small saucepan, add in the sugar, water, and ginger slices. Turn on heat to medium and let it come up to a simmer. Simmer for 5 minutes. Remove from heat and let cool with ginger slices in it. In a large mixing bowl, add in the butter. Turn mixer on high and beat until creamy. Add in the powdered sugar, milk, and pear juice. Beat on low until powdered sugar is mostly incorporated. Add in the finely grated ginger. Turn mixer up on high and beat until the frosting is light and fluffy. It will take about 2 - 3 minutes of whipping. Add the first layer of pear cake to a cake plate. Add a decent amount of simple syrup to the cake. I think I used about half of the syrup and brushed it in. You can add as much or as little of the simple syrup as you like. Add a layer of ginger frosting on top of the cake. Make sure the frosting is evenly spread on the layer. Add the second cake layer. Brush on the remaining simple syrup. Again, add as much or as little as you like of the simple syrup. Add a heap of frosting to the top of the cake. Spread it out evenly and push the excess off the sides. Work the frosting down the sides of the cake. Grab extra frosting when needed. Keep the frosting thin on the sides. 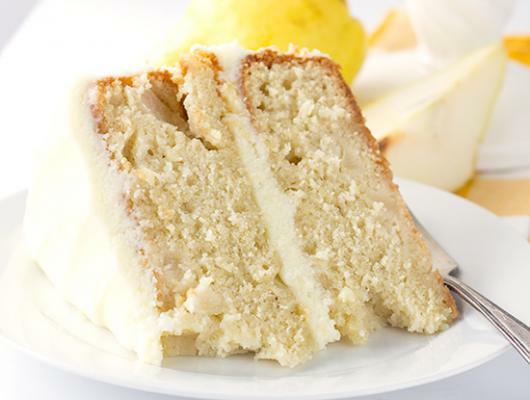 Add the pear and sliced crystallized ginger to the top of the cake. 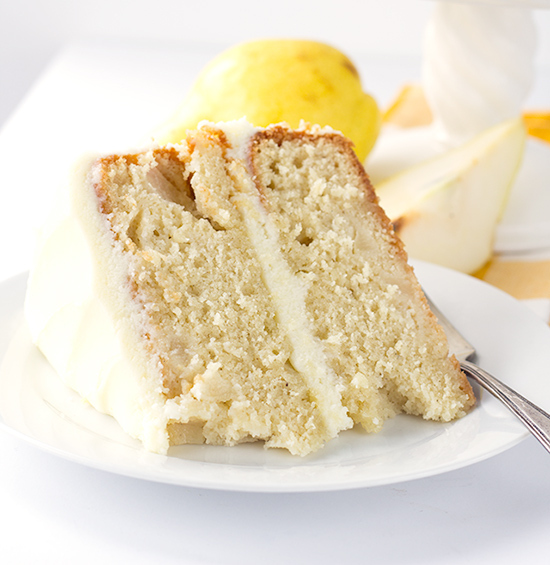 Ginger Pear Cake - dense cake filled with chunks of pear, topped with ginger simple syrup and slathered with ginger frosting. For more of my decadent dessert recipes, visit my blog here.